Have you ever heard of Cougar shoes before? If you haven't it's okay neither have I until I had this great opportunity to do this product review for their latest line of rain boots and snow boots! Cougar shoes is a family owned and run Canadian company. They have been around since 1948! Their boots are made for the harsh winter weather but are still stylish. 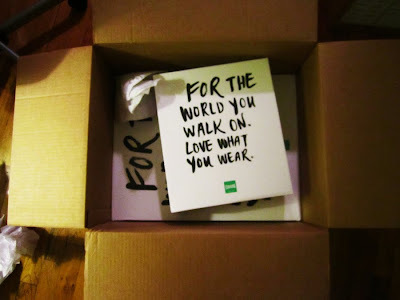 Even their slogan is stylish "For the world you walk on love what you wear." Also not only do you not have to worry about not looking stylish in these boots but you don't have to worry about your feet being wet and cold. Cougar shoes guarantees waterproof boots! I'm in total love with both these boots. I wish I would have had these Ringo Star snow boots when I went to Chicago in January, my UGGS did not stand a chance against the Chicago winter weather. There's no doubt in my mind that these boots would have laughed at Chicago's weather. These boots are 100% comfortable and 100% warm. I love how high they are (they come a little below the knee) and I love the fur collar. You can feel the insulation as soon you put these boots on. It's as if they are hugging your feet and legs. I have never owned rain boots that are low cut. These rain boots might be low cut and are super adorable but they are tough little guys. You can feel how these are defiantly going to keep out any type water. I love the sock collar of these boots, it gives the boot a fun and funky look. Of course my boots came the day after New York got hit with all the rain. I don't think I have ever wished for it rain before like I am now! Sorry to my other fellow New Yorkers. 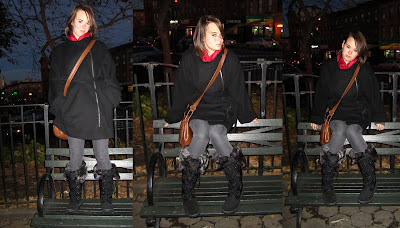 I made my boyfriend do a little photo shoot tonight down at the park of my new fantastic Cougar shoes! I can not wait to test out both of these bad boys! Bring on the snow and rain!! If you live in a cold weather region I highly suggest you to go out and buy yourself some Cougar shoes. If you are located in the US and Canada check out their website cougarshoes.com and find the nearest location where you can buy your pair of boots! If you live outside of the US and Canada don't worry you can buy your pair online: zappos.com, Nordstrom, DSW and amazon.com. I want to give a big thanks to Matchstick Inc., Pamala Gomez of addikted2fashion.com, and of course Cougar Shoes for this awesome opportunity! PS. Thank you all for reading this entry! Please take 2 minutes to fill out this survey for Matchstick Inc.. For every survey my readers fill out they will donate $2 to the Red Cross! Awesome, right? Well just fill out the survey here to help out a great cause and to give some feedback on a great company! THANK YOU!!! No, never heard of this before. But I like them. I guess I will need to save up for a pair. Cool, never heard of them either. I love the tibent rain boots! So cute,,,I think I want!! I've never had warm shoes! I have to change that this season! Wow I really have never heard of them before but they look like a perfect match for the cold, rain snow slush that we get here in Toronto. Cute! Hadn't heard of them before, but I'll check them out. Nice blog, btw! I think I'll take that advice on the Chicago winter boots. I need a new pair!